First Sentence: I first met Dean not long after my wife and I split up. I'm not sure where to begin with this one, so I'll start off with the plot summary for a change. Sal Paradise is our first person narrator, a college student who has already divorced one wife and lives with his aunt. He is a writer. In 1947, a young man named Dean Moriarty drives into Sal's life and brings "the road" with him. From 1947 to I think 1950, Sal ends up crisscrossing the United States in a sort of mad chase, penniless and under the influence of various substances. 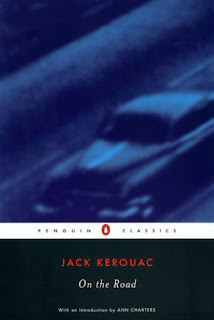 There isn't really a plot at all, really, and although maybe there's some reason why the chapter breaks exist where they are (I pay very little attention to chapter breaks), the book reads exactly the way Jack Kerouac wrote it: as a spooled narrative based more on feeling than anything else. On the Road has been familiar to me by reputation for quite a long time but I'd never actually picked it up before. As soon as I did I started to wonder about it, and it became one of the rare List books that I actually sought out additional context on while reading. Specifically, who the hell is Jack Kerouac and what made him this way? The other post-WW II books I've read so far have felt more marked by it, and the character of Sal Paradise, who is barely a character and very much the author, seems to have no connection to that experience. So thanks to Wikipedia I discovered all kinds of cool things about Kerouac: he had French Canadian parents and spoke French, he wrote On the Road in three weeks on an enormous roll of paper, and alcoholism killed him at 47. Also, he served only eight days of active duty during the Second World War. I didn't have the energy to learn anything more about the Beat Generation, besides the fact that Dean Moriarty was inspired by a man named Neal Cassady. I didn't enjoy reading this book. It's breathless and also pointless, just an exploration of sad white kids being horrible to each other and everyone else, that runs around in circles. I'm too old and have never been cool or reckless enough to find the ideas expressed in this book appealing. Dean Moriarty and the rest of them strike me as incredibly tragic rather than liberated, although I can see how at that time, they'd be a bit of both things. Both the style and the characters' actions pushed me away. Dean and Sal are the only two who pop off of the page as anything more than names most of the time, and the women are especially underserved, usually just staring wide-eyed and despairing at the wild actions of the men around them. I can appreciate that this is an important book in the history of 20th century literature, but I don't feel as if I learned anything from it. Unless the Beat Generation and their philosophies hold a lot of fascination for you, On the Road is pretty skippable. They rushed down the street together, digging everything in the early way they had, which later became so much sadder and perceptive and blank. But then they danced down the street like dingledodies, and I shambled after as I've been doing all my life after people who interest me, because the only people for me are the mad ones, the ones who are mad to live, mad to talk, mad to be saved, desirous of everything at the same time, the ones who never yawn or say a commonplace thing, but burn, burn, burn like fabulous yellow roman candles exploding like spiders across the stars and in the middle you see the blue centerlight pop and everybody goes "Awww!" Dean took out other pictures. I realized these were all the snapshots which our children would look at someday with wonder, thinking their parents had lived smooth, well-ordered, stabilized-within-the-photo lives and got up in the morning to walk proudly on the sidewalk of life, never dreaming the raggedy madness and riot of our actual lives, or actual night, the hell of it, the senseless nightmare road.